Sounds New will be at The Gulbenkian Theatre on Sunday, 5th May between 11am and 5pm with A Musical Guide ToThe Galaxy. This will be an action-packed day for the family with extraordinary musical happenings, workshops and dance. Performers will include Dance Warehouse, musicians from Canterbury Christ Church University, face painting, drama, singing and many more bite-sized performances. Solar Sounds, an education weekend with The Philharmonia will be part of the day with a performance of a new piece composed by young musicians. On Thursday May 9th the 1pm lunchtime concert at St Gregory’s Centre for Music will feature New Perspectives from Royal College of Music with their conductor Timothy Lines, performing Tierkreis (Zodiac), a work by Karlheinz Stockhausen based on the twelve signs of the Zodiac. Originally written for music boxes, Tierkreis remains one of Stockhausen’s most popular works, also because of its semi-improvisatory nature. This concert will also feature works by Messiaen and Colin Matthews. The eagerly-awaited annual jazz appointment returns with Sounds New bringing Jazz and Big Bands to the Whitefriars. Saturday, May 11th promises to be a whole day of fun and music kicking off at 10:30am and featuring CCCU Big Band and OrbiPLAYA Big Band and BIG BRAND NEW amongst others. The Curious Curator, which this year will include visual art, poetry and sound installations will be exhibited at The Front Room of the Beaney Institute from the 4th– 11th May. It will include the work of artists, musicians and poets from local schools, universities and poetry groups. Primary School Children will be invited to two concerts at St Peter’s Methodist Church, Canterbury on the 7thand 9th May at 11am. The first, in collaboration with Contemporary Music for All, will be an opportunity to hear and participate in Paul Burnell’s Aim Straight for the Starlight, and will also include the CCCU Scratch Orchestra. The second will be a visit from the Sounds New Roadshow, which goes round all the schools in Canterbury to introduce them to new music. These concerts are part of other All for One Series when the audience is invited to contribute £1. Other workshops include an open composition workshop by CoMA London with Canterbury Christ Church University composition students on Saturday, 4th May. 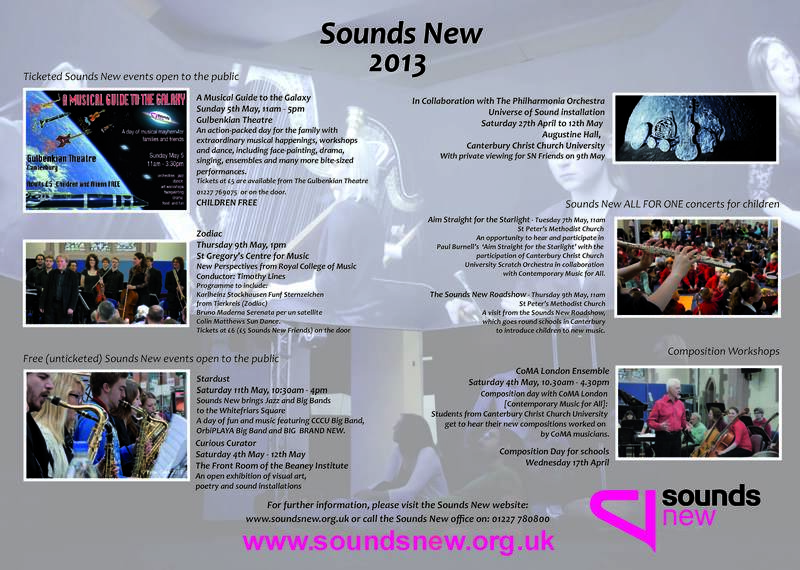 For further information, please visit the Sounds New website: www.soundsnew.org.uk or call the SN office on: 01227 780 800. Tickets for The Gulbenkian are available from The Gulbenkian Theatre 01227 7769075 and are £5.00 each, children free. Tickets for Zodiac on the 9th May will be £6.00 each and can purchased on the door. All for One concerts £1.00 on the door. University CoMA London Ensemble at Sounds New. CoMA [Contemporary Music for All) comes to Sounds New and Canterbury Christ Church to workshop new works of CCCU composition students. Stockhausen comes to Canterbury: Zodiac. If you’re going to be visiting the Universe of Sound installation at Augustine Hall over the next few weeks, we’d love to hear your reactions / thoughts / see your pictures (or even video) of your visit! Sounds New and the Universe of Sound is our digital wall, where you can post your comments, reactions, and images of your visit to the installation: let us know how you got on, maybe even post footage of your trying out the Conducting Pod ? Go on: you know you want to! Visit the wall online here.